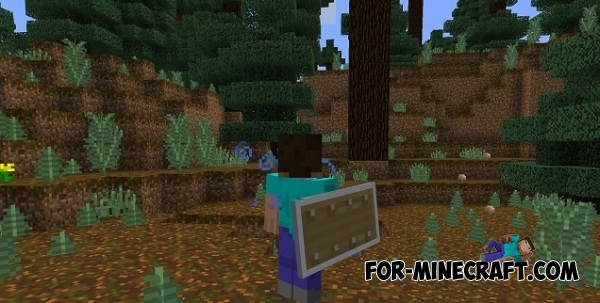 Shields Mod adds the shields in Minecraft Pocket Edition 0.14.0 which you can use to increase your protection. It's a very useful mod for survival, but unfortunately mod does not give an opportunity to hold simultaneously two items in hands. How to get and use the shield? The shield can be crafted in the crafting table or getting from the creative mode (shield - id 502). Crafting is a very simple so you do not have any difficulty with that. To activate the shield you need to put it into one of the slots and select this slot. As soon as you do this, you will get an immediate additional effects to the defense, namely, resistance IV and slowness III. Enable script and click the "Add"
Its only an texture pack. Nice i want those sheild i really want it!!!!!!!! !